Our breakthrough Reporting Dashboard just arrived, and we're confident this technology will launch apartment marketing campaigns to all-new heights. 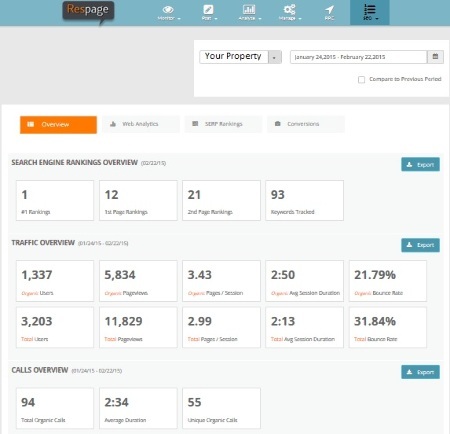 Vigorously tested, remarkably simple, and incredibly affordable, the Respage Reporting Dashboard provides the multifamily industry with all the tools apartment management companies need to monitor their marketing campaigns from a single interface. Designed to emphasize the most pertinent information, the Reporting Dashboard retrieves real-time insights on a website's traffic data and analytics, Google rank placement, and call conversions, the top three key performance indicators when gauging campaign success. We've named these features Web Analytics, SERP Rankings, and Conversions, respectively. Web Analytics, which records website traffic, helps property managers gain perspective on what pages garner the most interest from users, insight that can be extremely helpful for identifying what generates leads. SERP Rankings, which tracks a multifamily website's rank in Google and other popular search engines, allows property marketers to assess multiple keywords for their site simultaneously so that they may evaluate the effectiveness of their Search Engine Optimization (SEO) campaigns. Conversions, which records organic call conversion data, gives property managers an inside look of the leads funnel that starts in a search engine and ends in a call. To save our communities valuable time, users have access to a general Overview feature immediately after signing in to the dashboard. This feature compiles all of the above data in a single overview so that marketers can retrieve information as quickly and conveniently as possible. And to top it off, all data can be collected and interpreted on a daily, weekly, or monthly basis. While all of these features are impressive on their own, Respage has yet again gone the extra mile by gift-wrapping our Reporting Dashboard in a concise and beautiful design that's as easy on the eyes as it is to navigate. Though in the event one does experience a problem, our dedicated team of property marketing specialists is standing by to offer technical support. Want to learn more about how the Respage Reporting Dashboard can work for you? Contact us today!